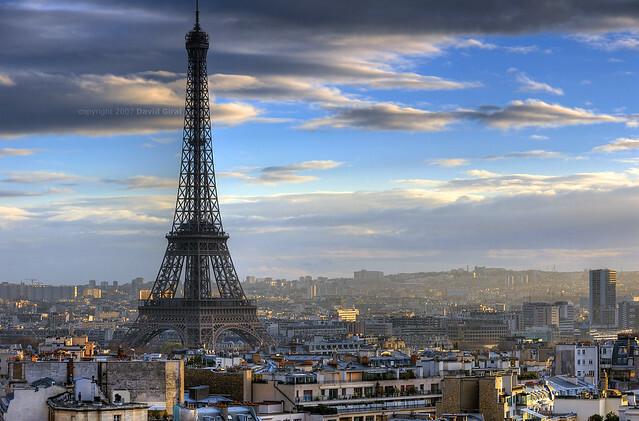 On this day in 1889, the Eiffel Tower was completed. The Iron Lady (La dame de fer) was the most contentious aspect of the design for the Exposition Universelle hosted by Paris. Opening to the public a month later, it was timed to coincide with the centennial of the French Revolution and thus show the country’s progress since that time. But the celebration of all things French (with a nod to all those other countries) was dwarfed by the fête on behalf of the extraordinary city itself. 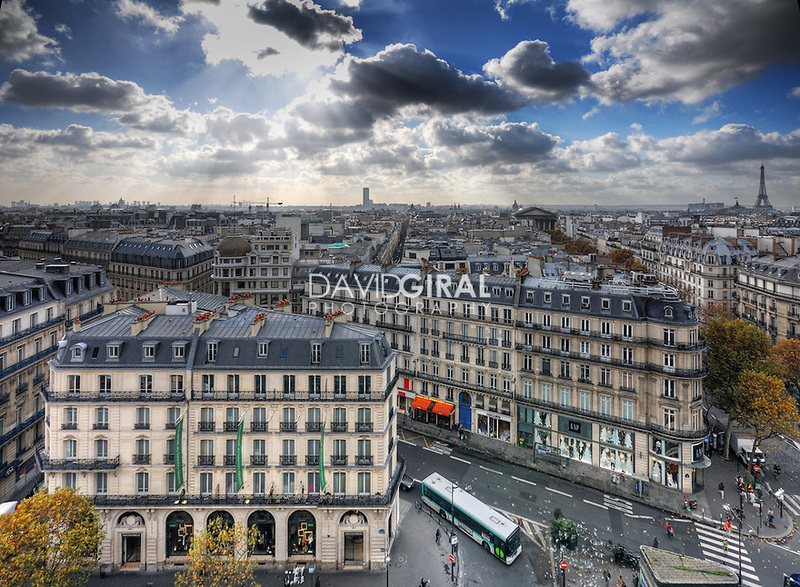 Just a few decades earlier Georges-Eugène Haussmann had made a new plan for Paris and directed the construction of mile upon mile of broad boulevards lined by fine townhouses, smart shops and glitzy cafes, dotting the metropolis with spectacular monuments of modern life like the magnificent Opera. The Exposition celebrated achievement from the world over, but also was meant to draw people from around the world to the French capital to gawk at its greatness. As a symbol of its progress from a medieval burg to the center of European culture, engineer Gustave Eiffel (1832 – 1923) dreamt up a truly amazing, unprecedented structure to announce the technical and artistic prowess of France. 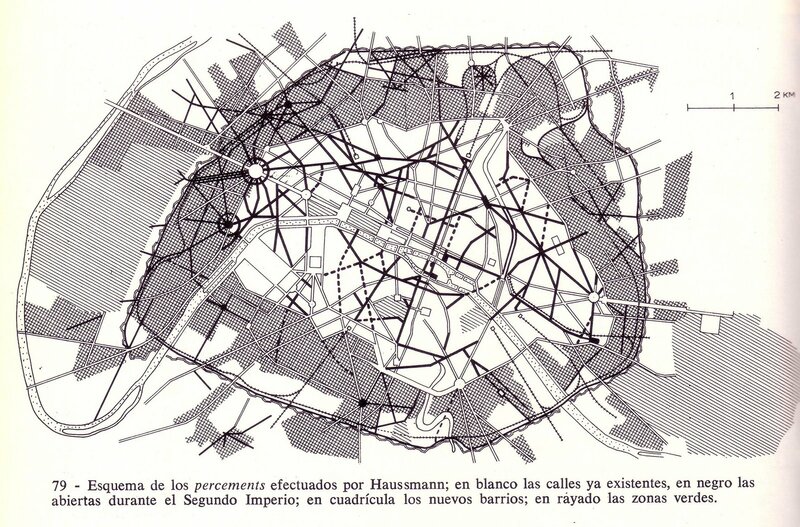 He had built his reputation through the construction of railway stations in many French cities and as far away as Budapest, gasworks in South America, a lighthouse in Eastern Europe, and the interior framework of the Statue of Liberty. He had big vision, and if Dan Burnham hadn’t said it first, maybe it would have been Eiffel who proclaimed “make no small plans” (and he would have said it in French–Ne pas faire de petits projets–which would, naturally, be cooler). 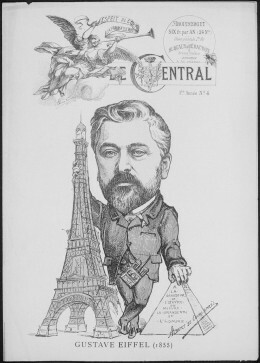 The grandness of Eiffel, as a visionary and as a person (all his pictures seem to communicate a very comfy confidence), is shown pretty clearly in the great caricature above–do note the way he nonchalantly leans on the Great Pyramid, and accessorizes with Notre Dame as a watch-fob. A monument to match the social stature of its designer, by any measure the sheer height of the tower was extraordinary, throwing ancient landmarks as well as newer ones in the shade. Completed in the same year, the very tall (for a masonry structure) Mole Antonelliana in Turin reached 548 feet, a little taller than the tallest of Gothic structures, including the recently completed Cathedral in Cologne (1248-1880), which rises to a height of 515 feet. America, the land of youth and optimism, was building up some tallish skylines, but its 555-foot Washington Monument was taller than any of them, but it was masonry and hopelessly old-fashioned (beyond old-fashioned, downright antique). The Eiffel Tower didn’t merely out-inch these tall things (as is the case now with even mega-tall structures scraping upwards by a few meters here, a few meters there); it soared a whopping 1063 feet to its top (or, in French measure, 490.6 baguettes tall). Even the first of the great twentieth-century skyscrapers, the Chrysler Building, topped out at just 1,046 in 1928 (still 17 feet–or, in American measure, 22.7 Super Big Gulps–shy of the top of the Eiffel Tower). At the heart of the issue was the fact that, in the midst of a city that had been so beautifully and consistently developed by gazillions of architects trained in the Ecole des Beaux-Arts method (with roots back in the time of Louis XIV, for Heaven’s sake), this hulking metal structure simply wasn’t architecture. Engineering: oui; building: oui; architecture: non, non, non! The tower looked unfinished, unarchitectural, unartistic; it was an “ungainly skeleton,” “a carcass waiting to be fleshed out with freestone or brick.” According to cultured aesthetic taste, the use of iron was a mere handmaiden to the great lady Art. Charles Garnier designed sweeping metallic structures to create the volumes of gorgeousness at the Opera, but they’re not meant to be seen–the gorgeous is meant to be seen. Iron might be evident in the design of new department stores, but their architects and managers had the good taste to display it on the inside, not at the street front. The rare exuberant use of iron on the street was in Hector Guimard’s metro stations of ca. 1900 which were more appropriate, and excusable, since to use one, one was already descending into the bowels of the earth to engage in a very physical way with a technical, engineered apparatus. And, by the time these started popping up all over Paris, the way had been paved for public acceptance of iron architecture by la Dame de fer. No doubt, plenty of outraged citizens went to their graves shaking their fine French fists at the Tower, but many, many more got over it, and fast. The tower became the most popular tourist attraction in the city, and remains one of the most-visited monuments in the universe (one estimate suggests over 200 million visitors since its construction–equivalent to the current populations of France, plus the UK, plus Germany); although it’s probably not a French thing to have the last laugh, you can bet Monsieur Eiffel breathed his last with that well-worn expression of smugness still plastered across his fine visage. So many spectacular photos! How can I ever leave my apartment again?! and individually recommend to my friends. I’m sure they will be benefited from this website. You are currently reading March 31: La dame de fer at Clio’s Calendar: Daily Musings on Architectural History.